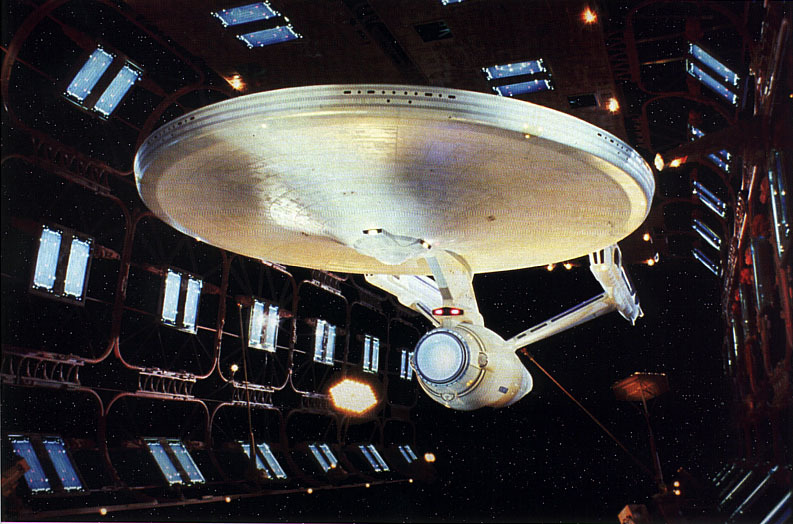 The original USS Enterprise NCC-1701 was one of the most famous ships in Starfleet history. During its long and distinguished career it underwent many upgrades, including a substantial refit between 2270 and 2271. Following the completion of Kirk's first five-year mission, the USS Enterprise NCC-1701 was recalled to Spacedock for a major overhaul. Minor modifications had been made in the past, but by 2270 the advent of new technologies meant that every system needed to be upgraded while the interior was completely redecorated and refurbished. Captain Willard Decker was in charge of the refit and he was given technical assistance by Montgomery Scott. The overhaul was so comprehensive that it actually increased the length of the Enterprise from 289 meters to 305 meters. The refit retained the familiar two-hull configuration of the previous design, but in nearly all other respects the Enterprise was completely rebuilt; it was given new hull plating, and the warp nacelles - which were attached to pylons near the stern of the engineering hull - were sleeker and more swept back. Another major difference to the exterior of the ship was that the support pylon connecting the saucer to the engineering hull now housed the main photon torpedo launcher; on the original design, it was located on the underside of the saucer section. The massive power for these units came from the engine room which, in common with the medical facilities, shuttlebays, bridge module, transporter room, and many other sections, had been totally redesigned. A recreation area, equipped with many games, filled a huge open space on deck 8. A giant viewscreen, suitable for imparting data to a large portion of the crew, was also a major feature of the room. The refit ship could travel at faster warp speeds than before, and its phaser power was increased by routing it through the engines. In addition, the main sensor dish was redesigned, with a much larger, blue inset curved unit replacing the gold-colored dish of the original. This refit was the last major upgrade for the original Enterprise before it was destroyed by Admiral Kirk in 2285 to prevent it from falling into Klingon hands during a rescue mission to recover Captain Spock's body. "U.S.S. ENTERPRISE NCC-1701 (2270-2271 REFIT)" - DECEMBER 2001 ISSUE 32 STAR TREK: THE MAGAZINE COPYRIGHT OF PARAMOUNT PICTURES.